Encourage peace and harmony through your clothing choices. Peace, harmony, and lasers. What do you get if you mix the minds behind Unskippable, and the artist behind Name Game, and apply the resulting creative soup to the world of fashion design? You get the t-shirt you see right below these very words. 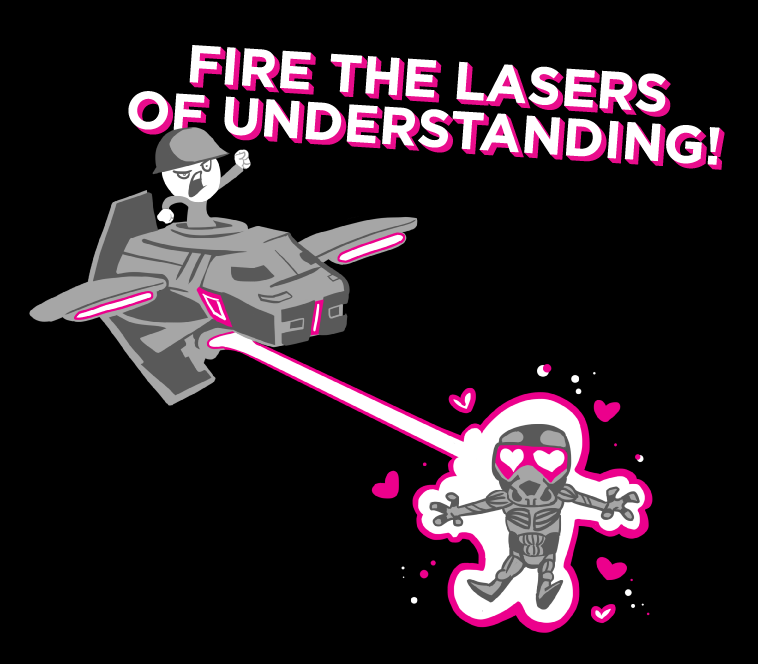 The shirt was inspired by the recent Unskippable episodes, which lovingly poked fun at the intro to Crysis 2. 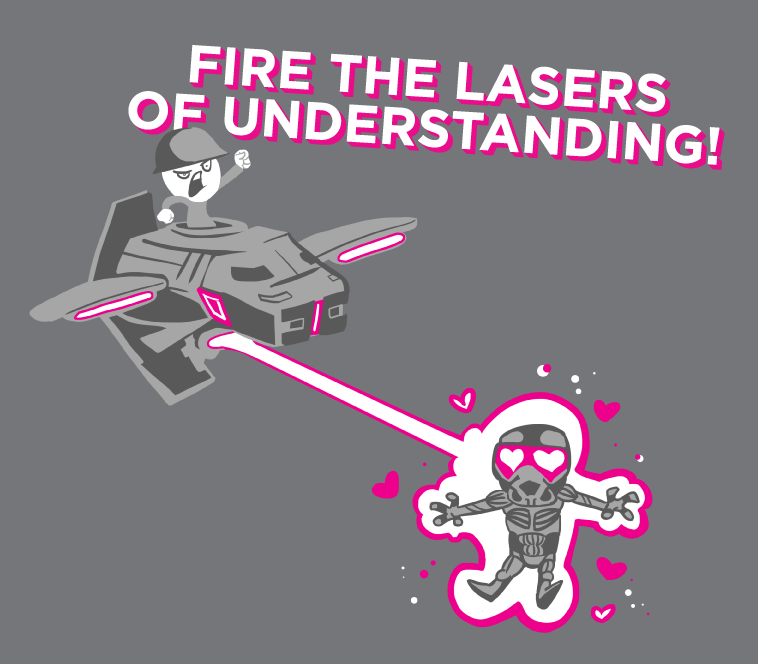 Unskippable creators Graham Stark and Paul Saunders came up with the concept of turning one of the choice lines from the episode - "fire the lasers of understanding!" - into a t-shirt, and turned to Name Game artist LeeLee Scaldaferri for the artwork. 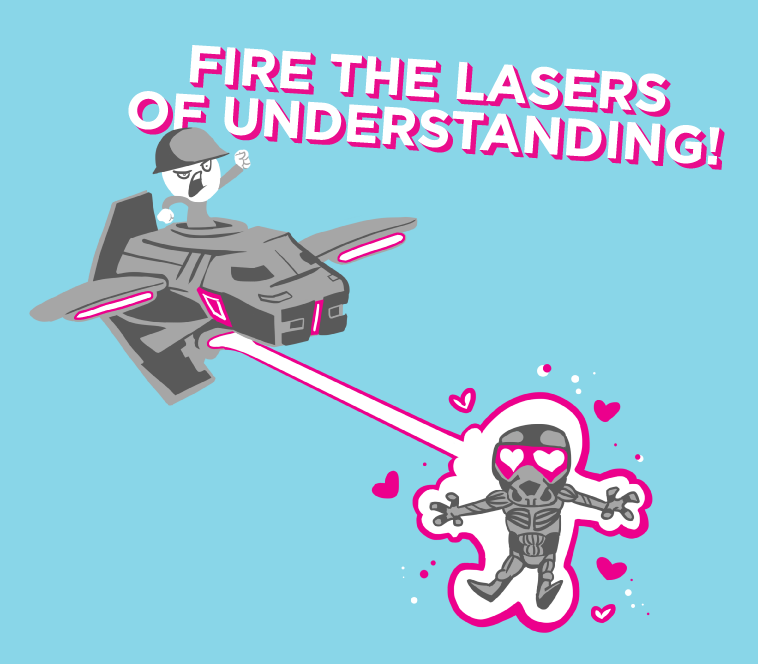 The result is a tiny flying tyrant, firing beams of pure love and compassion at super soldiers in high-tech armor. The shirt comes in black, charcoal, and sky blue, and either a unisex or a skinny fit. You can pre-order the shirt at the Loading Ready Run website until August 1st. If enough people pre-order it, LRR will do a run, and your shirt will be sent to you, along with a complimentary button for being an early adopter. If the pre-order threshold isn't reached, your money will be refunded in full and everyone goes his or her separate way. Somehow though, I don't think that's likely to be a problem.